1941: Deep behind enemy lines in the blistering heat of the Sahara, a Kiwi unit of the elite Long Range Desert Group (LRDG) is ambushed by an Italian patrol in the remote valley of Gebel Sherif. 2008: Three amateur historians, among them Kiwi Brendan O’Carroll, venture 4000kms into the Libyan Sahara retracing the footsteps of their wartime heroes in search of Gebel Sherif, the only battlefield where New Zealanders fought during WWII that remains untouched. April 2009: The documentary ‘Lost In Libya’, tracking both the historical and modern day journeys screens on Anzac Day to critical acclaim and excellent ratings. June 2009: Lost In Libya is released on DVD and GetFrank interviews director Dan Henry and world expert on the LRDG, Brendan O’Carroll. What was it that made you want to tell this story about the exploits of the Long Range Dessert Group in the Sahara Desert? Dan: It had all the hallmarks of a brilliant story. It’s a great story of “firsts” – the first special forces in action, the first kiwis to see action in WW2, the first men to tame the vast Sahara in motorised patrols and prove it was passable, the first medals awarded… the list goes on. And that’s just the historic story. The challenge in telling historic stories on television, and making them appealing to a broad audience is finding the way to package the story and give it relevance. 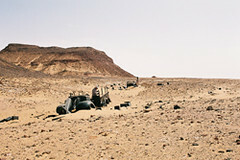 With Lost in Libya we had the perfect ‘vehicle’ for telling the historic story, in the modern expedition that Brendan and his friends were planning to undertake. Having that modern journey which mirrored perfectly the historic story provided the perfect way to bring the programme to life. 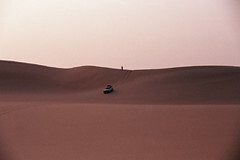 And of course getting the opportunity to drive through the Sahara is pretty rare – and too good to turn down! Brendan: They did what others thought impossible, by crossing into enemy territory through the Sahara to spy behind their lines. These Kiwis who came from a green, fertile land, to one of the most arid places on earth. Most had never seen a desert before, yet adapted well and became masters of desert survival, navigation and warfare. 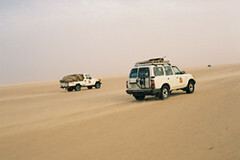 Libya is a unique place to visit - how did you go down with the locals and did you meet any tourists? Dan: We were treated like VIPs! Well, it seemed that way anyway. We hit a few obstacles along the way in the applications for visas, and all the red tape to actually get into the country… but once we landed, we were whisked through customs and treated wonderfully. It was such a pleasant surprise. Remember this is the country that was the “axis of evil” in the mid-eighties… Ronald Reagan called Gaddafi “the most dangerous man in the world”… so all bets were off – I wasn’t sure what to expect. But it was very relaxed and friendly. The people were extremely welcoming and warm. We had a total contingent of maybe 16 people in our convoy, and many of those were Libyans – the drivers, the cook and the like. They were great – hard-working, but always laughing and ready for a cuppa at the drop of a hat! Because we spent much of the time in the desert, we were pretty isolated from villages and towns, so didn’t rub shoulders with a lot of other locals. Not a great deal of general tourism in Libyan. There were a few foreigners in the hotel we stayed at in Tripoli. Most of them seemed to be there on business… though I couldn’t say what business. Brendan: Had no problems with the locals, I was expecting some anti western feeling, but received nothing but warmth and friendliness. No street vendors hassling you, the shopkeepers made you welcome, with absolutely no pressure to sell you anything. The only tourists I saw were a few Italians in Tripoli. Saw none in the desert. I felt safer walking the streets of Tripoli at night than I would doing the same in central Auckland. What was it like talking to the veterans about their experiences and what did they think of the documentary-making process? Dan: It was a real pleasure. One of the greatest parts of the whole process actually. They are such gracious men. To have us come into their homes and trawl their memories, and then trust us to treat those memories well in the re-telling of their stories – that’s a big thing. It was great just to sit and spend time with these men and their families. They’re not young anymore of course – Tom Ritchie’s 94 this year, Peter Garland’s 92 and Keith Yealands is a spring chicken at 88. So it can be quite a tiring process to be asked to sit and talk non-stop for an hour or two about stuff that happened nearly 70 years ago. The men loved the process I think… they all wanted to know what we thought of the desert when we got back. They were keen to see photos and the footage of course. And quick to point out that we had it easier with covered vehicles and air conditioning! Making TV can be a long, tedious job, and I think at times they wondered what was taking so long! But I think so often these days, old people are dismissed as having nothing to offer you know? Which is of course ridiculous. These are men who did incredible things – and not just during the war years but throughout their long lives. I can tell you that television is particularly guilty of ignoring old people. In fact anyone over the age of 39 is in grave danger of being “too old for TV”. Which is a worry isn’t it? Brendan: Most veterans are usually very pleased that someone shows an interest in their wartime history, so their stories could be recorded for prosperity before all is lost to time. They appeared to enjoy the doco making process. Do you have a favourite moment from the trip or the production as a whole? Dan: Tough one. I know I was absolutely elated when we had captured the moments which make up the final scenes in the programme. Given the difficulties in the days leading up to reaching our destination – to get that ‘in the can’ was such a mixture of relief and excitement. We knew we had the show now, no matter what happened. Drinking our first real beer after two weeks driving through the desert wasn’t bad either! Libya is a Muslim country, so alcohol is a no-go. But our first night after the desert was spent at the home of one of the locals from the convoy, who was a bit of a dab-hand at home-brew… Two weeks in the Sahara can work up a mean thirst! It was brilliant too, to see the finished programme on the big screen, before the TV broadcast. We invited along all the families of the soldiers involved in the show, and there was a real sense of occasion about it. Brendan: The thrill of exploring the lost battlefield of Gebel Sherif. Feeling the overwhelming sense of stepping back in time and feeling the violence that took place there. Seeing the numerous bullet holes in the trucks, wondering how anybody survived. Examining all the remains of the trucks and their supplies and equipment e.g. Munitions, plates, petrol and water tins, food and cigarette tins, broken rum jars; finding the NZ Army button that brought home the fact that there were New Zealanders there a long way from home. Just how difficult is it to film in such a harsh environment and were you at all tempted to throw in the towel? Dan: Not once were we tempted to chuck it in… we’d worked too hard and come too far! Although it was pretty hard at times; we managed to hit the windy season, and the wind seemed to blow every day for the two weeks we were in the desert. This occasionally looked good on screen blowing the sand around, but mostly was really unpleasant to stand around in – let alone try and operate camera and sound gear. But Ivars Berzins – the cameraman and Tony Spear the sound recordist worked really hard to make it happen. The conditions were unlike anything any of us had worked in before, with 43 degrees Celsius some days. But any times it got too tough, we just reminded ourselves that our experience was nothing compared to what the soldiers endured. The war was long-over by the time we arrived! Were there ever any doubts about reaching your goal of Gebel Sherif or thoughts perhaps that the wrecks would no longer be there? Dan: Yes – absolutely. We were confident that there would still be something to see at Gebel Sherif, but we just weren’t sure exactly what. Whether we could get there was another question. We did get into difficulties, as you can see on the programme… and we had to make changes to our route along the way and constantly adjust the plan. Apart form the weather, the biggest obstacle we faced was the uncertainty of the local authorities. The Gebel Sherif area was open when got there, but it was closed shortly after we left, due to the dangers posed by bandits patrolling the border with Chad. They’d taken hostages – which is never a good look for tourism. I understand the area might be closed still. 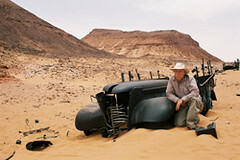 Which makes what we captured in Lost in Libya all the more special I think. Brendan: There were always those doubts, with the risk of accidents, breakdowns, getting lost, sickness, or permissions to travel withdrawn. The first real doubt was the sandstorm that blew up the day before reaching Gebel Sherif, I thought it could all be lost at that point. We were hoping to camp there but could not, however the wind dropped and we at least had a clear day when we arrived. Are there any more LRDG stories to tell and will you be telling them? Dan: There are. We only scratched the surface, and we’re examining how best to tell some more stories of these great men. There’s always interest in great stories, and certainly from what I can gauge, there’s a constant demand for stories of this type. We’ll keep you posted! Brendan: There are several more stores that could be told; the famous Barce Raid and the Battle of Leros defeat that led to the disbandment of the NZ LRDG for example. The Lost In Libya DVD is now available to buy with additional special features including stunning behind the scenes photographs. Check out TradeMe seller pacificbeacon to get your hands on one. Having read all I could lay my hands on about the LRDG and having spoken to Brendan, I found the DVD absolutely fascinating and it really gave me more insight into what those men must have endured and what they achieved. As an outsider and having served in the NZ Army I can understand why these guys in the LRDG were so good. Thanks for a wonderful DVD, thoroughly enjoyed it. The scenery and photography was fantastic. What a great story! Am looking forward to being able to get a copy of the Vid. But the report above gives some really good insight into the difficulties of making a video of this sort. I was overwhelmed by the DVD adventure. I wish I could have been part of it. What an incredible feeling it must have been walking in that battlefield and sensing the violence and tragedy of New Zealanders so far from home. I loved the parallel between the modern and the wartime adventures and how the pathos played out between the two timezones with the death of Rex Beech and the sickness of Roberto. A great New Zealand documentary, world class, I recommend it to all!